The Frustration Haul! And Latest Offers on Stores! When I was about to be transferred to Kolkata, my biggest concern was - makeup? How will I buy them? Well, even in Delhi, I used to buy online but then at times you need the latest ones which are yet to hit the stores! Anyways, I thought I won't buy ANYTHING (whom was I kidding!). Last Sunday, I just went mad and picked up whatever fell on my hand. Reason? I will tell you the offers currently in stores. 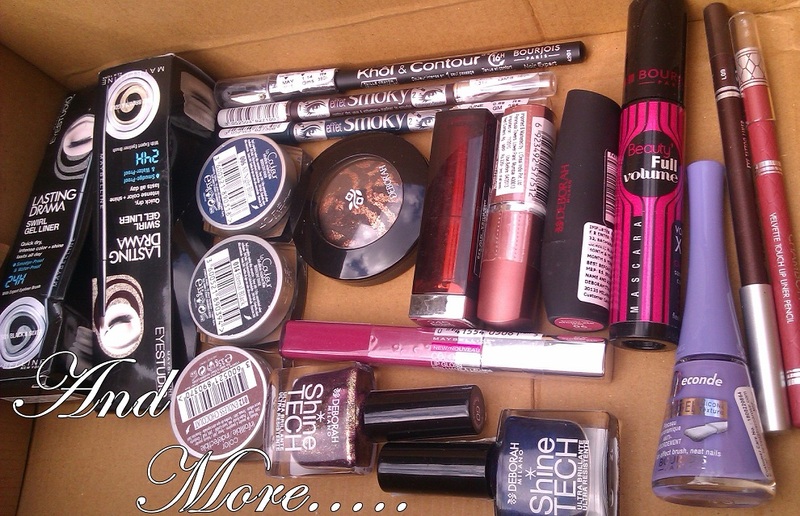 All Maybelline and L'oreal stuff - 15% flat off in Pantaloons. Bourjois - They HAD the latest ones I need in all shades! Nothing was OOS! On top of it they had gifts. I got a nice bag :D Wanna see? I hope you can sympathize with me for buying so much! Other stuffs are brought online but then there are more which are missing in the picture. When I saw the big bright sun yesterday afternoon and picked up stuffs to my terrace to click pics, I missed a lot of them. When I came back to pick us the additional stuffs - it started to RAIN! Again! Want anything to be reviewed first? hey loved your haul!!! whr did u get the deborah stuff from? is it available in retail? great haul! Will be looking forward for u reviewing this ^^. nice haul? Wht lip liner is that? why would you think Kolkata is in the back of beyond, I don't know, but I have found really amazing stuff here that I have searched for in Delhi. And they stock Ruby Woo, which is an achievement, since everytime I had hit Delhi stores or Kolkata stores, MAC seems to have run out of it. I suggest going to South City and go bonkers if you haven't already. I went to the MAC store and they said they do not have any lipstick in stock! They gave me their card and told me to call and confirm when they get it. lovely haul! I have three of the infallible eyeshadows now...check out my latest haul.